That’s Redgannet’s BBOTY at the top of the post. Read on to find out what it is! 2014 has been a good year for us at 10,000 Birds. We’ve traveled to lots of places, seen lots of great birds, and met lots of great birders. Also, we think we’ve done a pretty good job of sharing our stories with you. Hopefully, you’ve enjoyed them! So, as we’ve done for the last several years we thought we would share our Best Birds of the Year with you. Each Beat Writer was given the opportunity to share their rarity, their oddity, their whatever-it-was-that-made-one-bird-their-Best Bird of the Year. Below are our Best Birds of the Year. What was yours? Let us know in the comments…see you there! I was able to see and photograph many great birds in 2014 but my Best Bird of the Year would have to be the Great Gray Owl, the largest Strix in North America. It was one of two life birds (the other being Cassin’s Vireo) I photographed at the inaugural Mountain Bird Festival in Klamath, Oregon. I got to see a beautiful female and owlet on a trip to a secret nest location near Howard Prairie Lake (human-made nest structures have enhanced local breeding for these huge owls whose nest success is boosted to 83% on artificial platforms vs. 66% at natural sites). Later, Harry Fuller, President of the Klamath Bird Observatory, led us to an open meadow where we saw a pair of Great Gray Owls hunting in a meadow. My best bird of the year came right at the beginning of January as I was wrapping up my travels in Thailand. 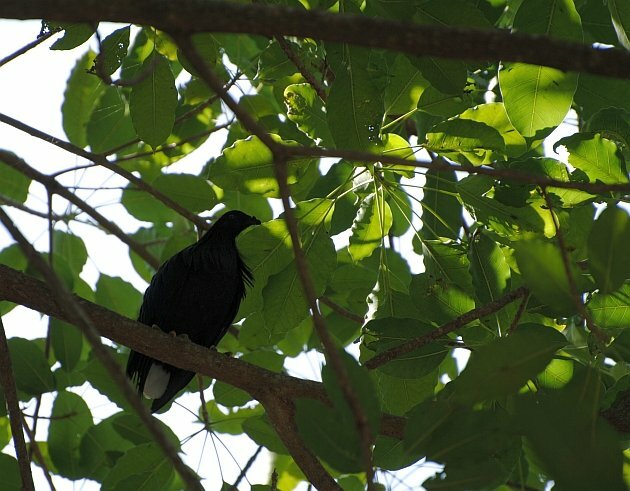 Nearly at the last minute, I bought a plane ticket from Bangkok to Krabi so that I could try for Nicobar Pigeon in the Similan Islands. At the time, I had no idea whether I would ever be returning to this part of the world so I decided to go for it while I had the chance. As a child, the Nicobar Pigeon‘s beautiful iridescent colors and unique appearance always caught my eye — it always stood out from the rest. However, its unique beauty is just one of its many special attributes. For one, it is a textbook island tramp specialist that lives only on offshore islands throughout the Pacific where few other birds live. Second, it is the closest living relative of the extinct Dodo Bird. Finally, the Similan Islands are perhaps one of the most beautiful islands in the world and form a stunning backdrop to this species, one of the loveliest pigeons in the world. The experience, the place, and the bird combine to make this my BBOTY. 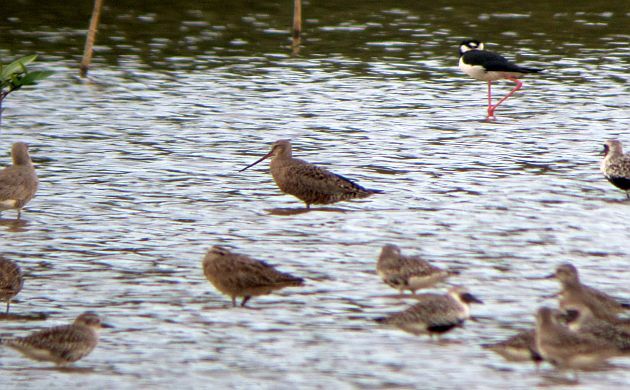 My BBOTY for 2014 goes to Hudsonian Godwit. The Hudwit edged out more than 650 other birds on my Costa Rican year list by a large margin because unlike Resplendent Quetzal, Maroon-chested Ground-Dove, Ornate Hawk-Eagle, and even Unspotted Saw-whet Owl, the last and only documentation for Hudsonian Godwit in Costa Rica occured in 1975. That was also the first and only record for the country until our sighting on April 27th. We (the other birders being Susan Blank, Josh Beck, and Kathi Borgmann) managed to nap the first photographic evidence for the species in Costa Rica on that memorable, 23 shorebird species day. I also blogged about that dreamy day. As of today I have no idea what birds I will see in December in South Africa. No matter, I called my BBOTY at breakfast on the first of January. 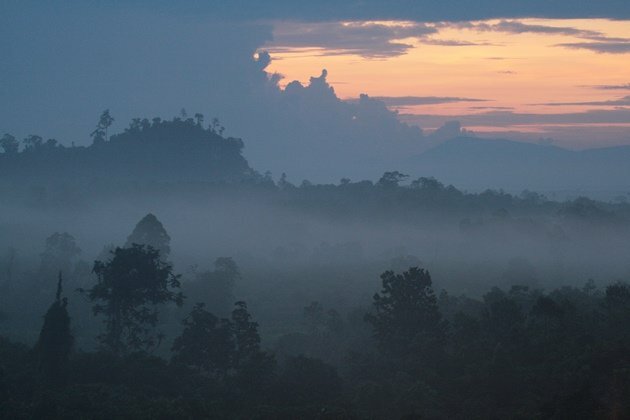 After a productive pre breakfast walk on my last morning in Danum Valley I was walking back satisfied but pittaless. 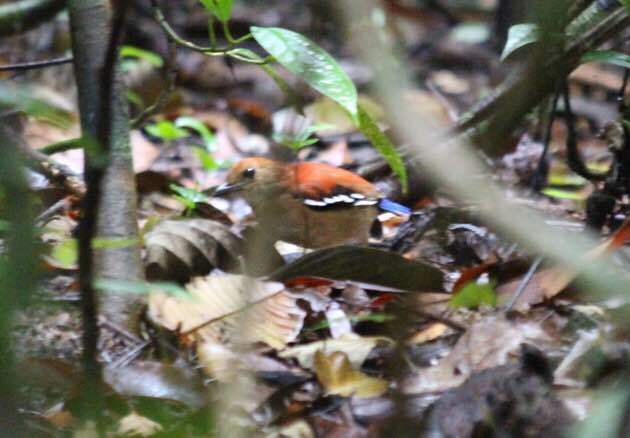 A whistle, a brief wait, a quick dash and bam, a female Blue-headed Pitta. I even managed to get a photo. 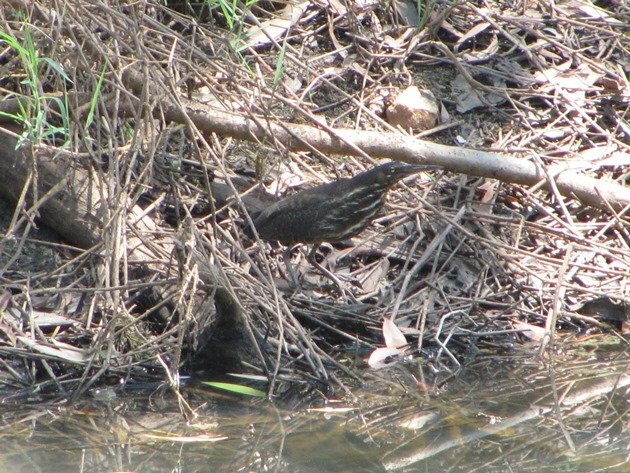 My BBOTY for 2014 has to be the Black Bittern that I observed at Marlow’s Lagoon, because I was able to show it to Grant hours later once he finished work and that is remarkable in itself! It was unexpected and even though there were many really good birds this year I think this one stands out. I am not expecting to come across another Black Bittern any time soon, so that makes it extra special! Maybe I should not say that….who knows what 2015 will bring!!! I think it was early autumn when my husband and I went hiking at the Schuylkill Center for Environmental Education in Philadelphia. We came over a ridge and along a trail that wrapped around a basin. Everything was green and leafy and I was disappointed that we hadn’t seen many birds at all. Up ahead in the distance we heard a strange chattery squawky sound up ahead in the distance, high off the ground. I’d never heard raccoons make that particular weird noise before, but that was my best guess as to what it was. The sound began to grow a little more frequent and urgent as we approached. Finally I was able to triangulate the noise, and locked my bins on a Great Horned Owl up in a tree maybe a hundred yards from us. It was almost dancing on the branch, teetering from claw to claw, never taking its eyes off us, making that strange, loud racket the whole time. The owl’s wings were partially lifted, like a cormorant sunning itself. 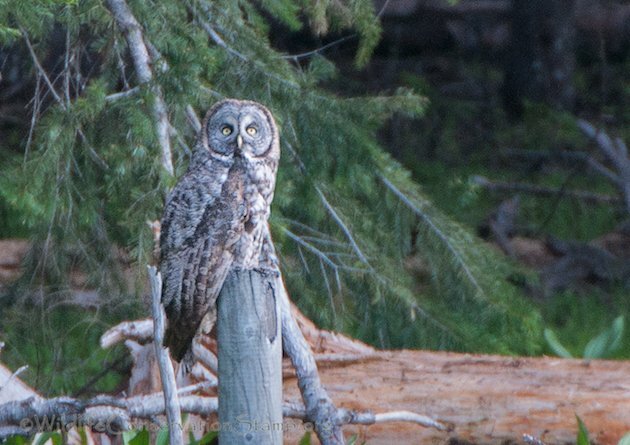 I passed the binoculars to my husband so he could get a look, and sensed that we should mosey along since we had probably disturbed a nesting owl. Before we could retrace our steps up the trail, though, the owl launched at us. I watched the whole thing and it was thrilling, magnificent, and terrifying, all at the same time. I had enough time to warn my husband that it was headed our way and we ducked. But it was still an awesome rush to see those huge wings quickly growing huger as they came nearer. It’s hard to say how close the owl got to us, but I’d guess within 5 to 10 feet. Over our heads and onto a tree branch behind us, and that was all we needed to scurry on down the trail. My heart was beating so fast and I was giddy with laughter. I was a bit sad, too, that we had annoyed the owl enough that it felt it had to strafe us … my normal MO is to avoid stressing out wildlife. But at any rate, it was a once-in-a-lifetime experience that was just incomparable; I hope I never repeat it, but was glad to have had it happen, just to enjoy the amazing encounter and horror movie–type buzz. 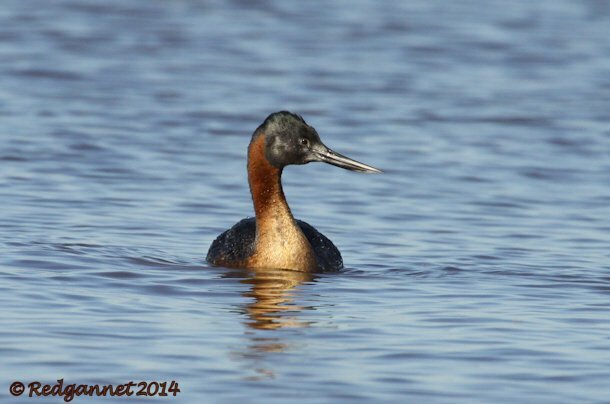 The Great Grebe popped up out of the Rio Plata, off Buenos Aires and I knew immediately that it would be my Best Bird of The Year for 2014. Having dipped a number of times while hoping for the world’s biggest grebe, I almost punched the air when I got a chance to tick it off. It’s a tie between the Willow Ptarmigan in New York State, the confiding Rufous-vented Ground-Cuckoo in Panama, and Hoopoe and African Penguin in South Africa. Yes, it was an exceptionally good year. Travel is good for the birding soul. 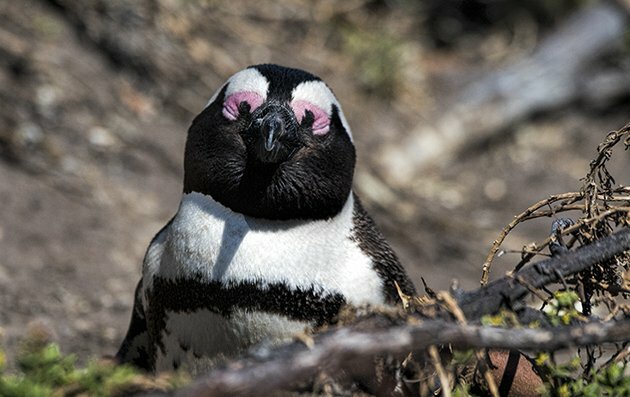 Final choice is African (aka Jackass) Penguin because I had such a wonderful time watching these creatures at Betty’s Bay and Boulders Beach. Once endangered, they lead happy, protected lives, oblivious to the tourists who love them. I could have spent hours watching them do their penguin thing–shaking themselves like water-flinging tops after a swim, taking care of their young in the artificial nests that have replaced their guano burrows, walking two-by-two down the path to the rocks, right next to the boardwalk. You can see a video of some of that water-flinging behavior in this video. This year’s choice fell on the splendid Bat Hawk that flew past me in the early morning light in southern Borneo. Apart from being an incredibly exciting bird, this is a species I had longed to see since my first trip to southern Africa way back in 1991. And a lifer nearly a quarter of a century in the making sure seems like a worthy choice. Since I do not write about birding, but rather, about birds, my best bird of the year is a bird from one of my posts. There were a lot of great birds to chose from but after careful consideration I went for this South African Barn Swallow (Hirundo rustica). In particular, the bird in the still from the video. 2014 has been pretty much a stay at home year for me with less than ten lifers (compared to an average of around five hundred a year for the past ten years!) After much contemplation, my bird of the year is a local species which I have seen many times before, but enjoyed superb encounters with this year. 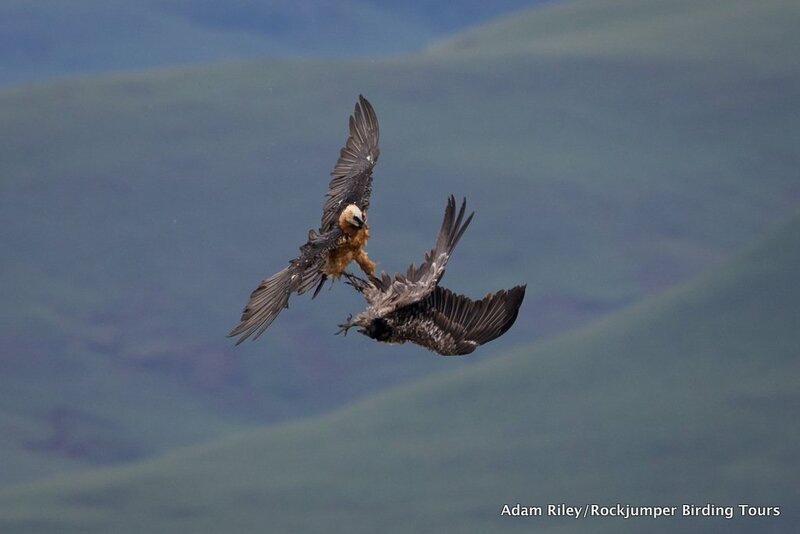 My choice is the Lammergeier or Bearded Vulture. This spectacular montane vulture reminds me more of a giant falcon as it cleaves the air on long wings. 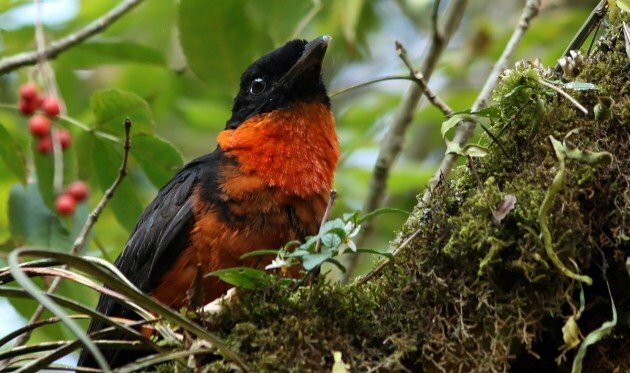 Besides being an impressive bird, its always found in breath-taking montane wildernesses which adds to thrill of finding this sought-after bird, despite its wide range through most of the major mountain chains of Africa, Europe and Asia. This year I spent 2 days at the Giant’s Castle Lammergeier hide in the Natal Drakensberg of central South Africa. We had up to ten Lammergeiers in constant attendance around the hide and I was lucky enough to catch this dramatic moment when an adult bird decided to teach a youngster some manners. Mike enjoyed a lot of his favorite kind of birding this year: world birding. Seeing more that 640 species throughout North America, South America, and Asia revealed many special species, but cotingas are often first among equals in discussions like these. Mike spotted this gorgeous Red-ruffed Fruitcrow gorging itself on berries at Santuario de Flora y Fauna Otún Quimbaya in Risaralda, Colombia. I had a tough time deciding on my Best Bird of the Year. There were several species of bird I really wanted to get in Costa Rica but none of them showed. I did see lots of amazing birds there anyway, of which probably a dozen could be my BBOTY. I had a couple of pretty good twitches this year too, birds like Willow Ptarmigan and Cassin’s Kingbird in New York and European Golden-Plover in New Jersey. I also found some rarities on my home turf in Queens of which Say’s Phoebe and White-winged Dove stand out. And I can’t forget the awesome birds I saw in Florida in January. (If I had seen and not just heard Black Rail I think my decision would be easy.) 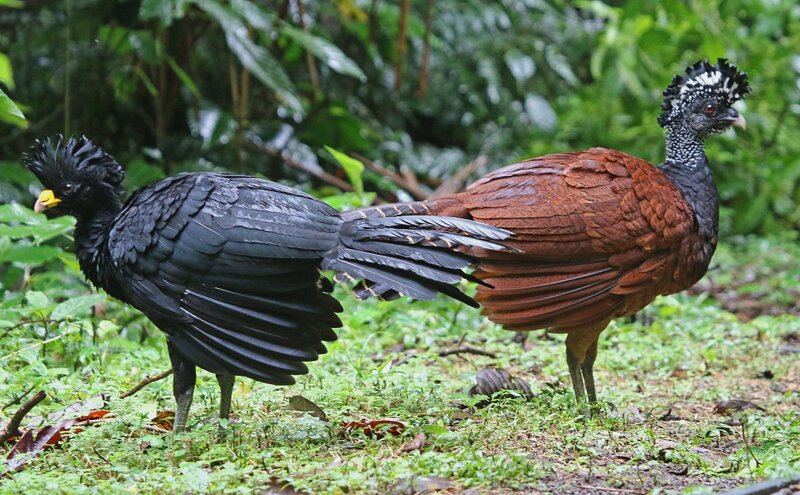 But, in the end, I think I was most impressed by a bird that we encountered more than I would have expected when I was in Costa Rica, the Great Curassow. My first view of these huge game birds when walking a rainforest trail at Finca Luna Nueva Lodge in the rain was stunning. They were big enough that when they flew you felt it! Getting more and better views, including of the rare barred form of the female, at Arenal Observatory Lodge the next day was just icing on the curassow cake. You can’t go wrong picking as your Best Bird of the Year a bird with “great” in its name. Don’t forget to share your Best Bird of the Year in the comments. Include a link to photos or a blog post if you have them. Either way, here’s hoping that your 2015 is full of birds and that you get at least one exceptional bird that makes your year! I think you forgot the link…but Emperor Penguin is just not fair. Well, I was going to say my best bird of the year was the Black-headed Grosbeak that I first mistook for a Baltimore Oriole. But really, my best bird was a Swainson’s Hawk that I had no idea of its ID, but since it was David Sibley who pointed it out, I took his word for it. I’m still mulling over the year. It’s either going to be a full blown male King Eider seen on Lake Ontario, April 1st (!) OR a Red-necked Nightjar in Spain. Both get their due on my blog which you’ll find by clicking on my name above. Thirteen Tufted Puffins by Protection Island here on the Olympic Peninsula. I’d never seen them before, and they are amazing to watch diving and filling their bills with small fish. Houbara Bustard on Lanzarote, searched for two days before seeing two right beside the track. It was a tough decision after birding 3 different areas outside the Midwest. The bird that made me gasp the loudest when first seen was the Golden-olive Woodpecker seen in Costa Rica. I just can’t believe the colors. They appear to be painted on. This is a hard one! My life list is still pretty small (~260) and this year was my best birding year yet, with 110 lifers seen! In terms of rareness I saw Red-cockaded Woodpeckers and Florida Scrub-jays. I saw some of my favorite birds with amazing looks, like Hooded Warblers up close and my life Kentucky Warbler just a few feet in front of me. I wish I got better looks at European Bee-eaters, which were really silhouettes. Hmm… I think I’ll have to go with Common Kestrel in Italy. Those birds were amazing. I’ve seen the hover-hunting in videos and stuff, but seeing 5-10 kestrels doing it at once was breathtaking. Definitely something I won’t forget. As the best birding adventure this year was Cornell’s Young Birders Event! Super fun and I got to meet some amazing birders! Who Doesn’t Like Birds, Tigers, or the Taj Mahal?